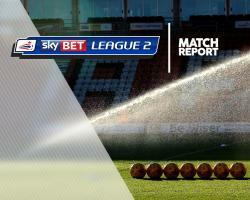 Leyton Orient kept their slim hopes of avoiding relegation from Sky Bet League Two alive by beating fellow strugglers Hartlepool 2-1 at the Matchroom Stadium. Goals from teenage duo Victor Adeboyejo and Tristan Abrahams, after Rhys Oates had opened the scoring for the visitors, leaves Orient seven points adrift of safety with three games remaining. Oates had opened the scoring on eight minutes when a poor header by O's defender Teddy Mezague gifted a simple chance to the Hartlepool striker. Orient levelled 10 minutes later when defender Michael Clark picked out 18-year-old Adeboyejo who stabbed the ball home at the near post.